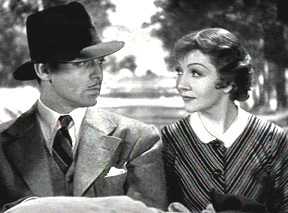 The memorable, romantic comedy that helped make Gable and Colbert big stars. 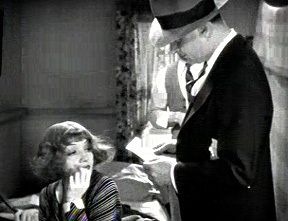 Director, Frank Capra, created an enduring classic with this romantic comedy film. Written by: Robert Riskin (screenplay), Samuel Hopkins Adams (short story). 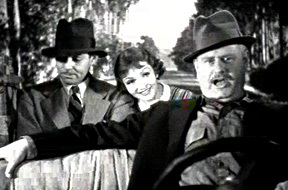 The cast includes: Clark Gable, Claudette Colbert, Alan Hale, Ward Bond, Walter Connolly, and Roscoe Karns. Tagline: Hunger strike, eh? How long has this been going on? 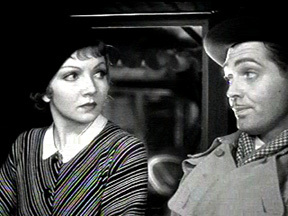 The basic story starts with a pampered heiress, Ellie Andrew (Claudette Colbert) being held against her will on her father’s yacht, who disapproves of her newly married status with her beloved, King Wesley (Jameson Thomas). 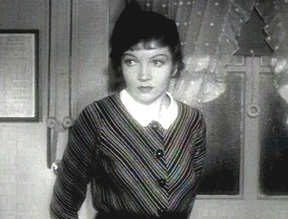 While her father, Alexander Andrews (Walter Connolly), tries to change her mind, she escapes by jumping into the water. Ellie takes a bus, hoping to get to New York, back to who she thinks is her true love. 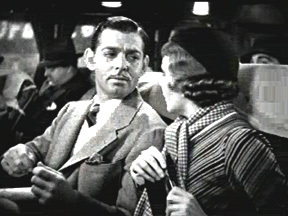 She encounters a honest speaking reporter, Peter Warner (Clark Gable), during this bus trip, who befriends her in a practical sort of way, taking care of her, as she doesn’t have any survival skills at all. He is honorably up front with her about his motives; to get her exclusive story. 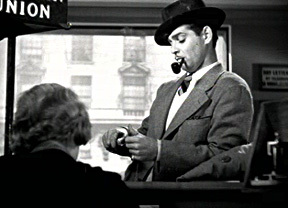 Of course, they had to at some point, get off the bus, and have some adventure on their own, trying to get to New York. They eventually fall in love, with numerous humorous complications. I have three favorite scenes. 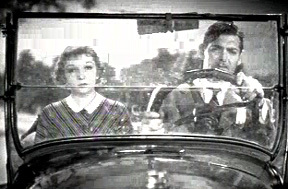 One is the hitchhiking scene, where Colbert raises her skirt, flashing some leg to get a ride from a motorist. 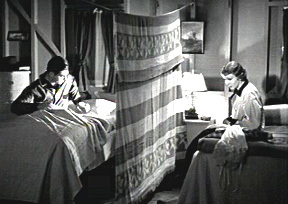 Another is the “Walls of Jericho” scene, where Gable and Colbert share a bedroom, separated only by a vertical sheet that is strung up between them. 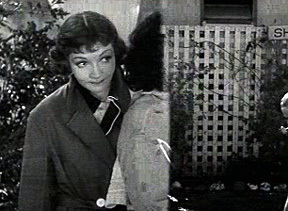 The third favorite series of scenes takes place near the end of the film, at her fabulous outside wedding ceremony, planned for her official marriage ceremony to King Wesley. Surrounded by all the throngs of their society, glorious flowers, huge wedding party, with background singers, her father traditionally is escorting her toward the minister and altar. He is busy telling her about how Peter loves her, how Peter only asked for the money he had spent on her during their trip together, not the 10,000 dollar reward. He further implores her to not go through with the wedding, and that there was a cab waiting for her, if she changes her mind. The film is still enjoyable after all these years. 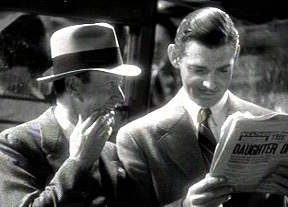 The film benefits from decent pacing, even by today’s standards, and the great, on- screen chemistry between Colbert and Gable. When this film came out, it affected the clothing industry. 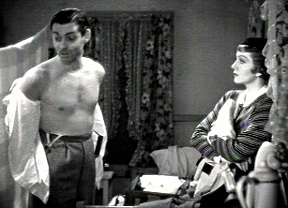 In a scene, when Gable takes off his shirt, he’s wearing no undershirt beneath. Almost immediately, undershirt sales plummeted. This is a classic because of the chemistry between the stars, its good humor, and sharp dialogue. 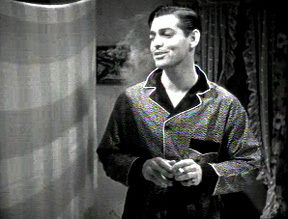 “It Happened One Night” was the first film to win all five of the major Oscars: Picture, Director, Actor, Actress, and Screenplay (Robert Riskin). Some have claimed that the 1970’s mega hit “Smokey and the Bandit,” with Burt Reynolds and Sally Field, was just an updated, “It Happened One Night.” I guess anything is possible, especially in Hollywood.